No relationship is perfect, and that is okay! While every couple is completely unique in their own relationships, I find that there are some overlapping relationship challenges and themes I notice when working with couples. Every challenging part of a couple’s relationship can be a learning opportunity and an authentic way to bring them closer together. 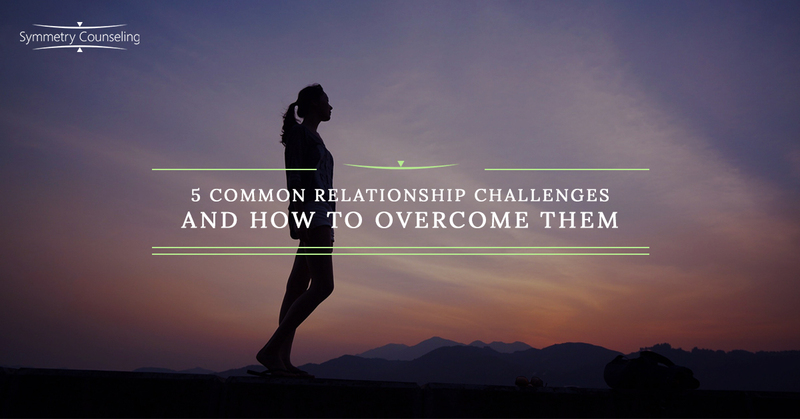 The first step is simply to acknowledge that there are going to be challenges in any relationship. It would be quite rare if a couple said, “Everything is wonderful all the time!” I would question if they are both truly expressing to each other what they need and how they are feeling! Below are some common challenges I see during couple’s therapy and how you can begin to overcome them. • Unmet Expectations/Needs. One partner may have had an expectation that you are going out to dinner while the other partner planned on cooking dinner. While this may sound minor, the point is that one or both partners’ expectations are not being followed through, and this could create a potential conflict. • Non-Direct Communication. Being non-direct could cause some potential disagreements as someone is left confused as to what is actually being asked of them. • Not Using the Correct Love Language. In his book, The Five Love Languages, Dr. Gary Chapman describes the five love languages, which are: receiving gifts, physical touch, words of affirmation, quality time, and acts of service. Not tapping into the love language your partner wants can also create for some challenges. • Different Coping Skills. Sometimes not understanding that your partner copes with stress differently than you can also create some challenges. For example, you may be confused that your partner’s form of self-care is simply watching TV on the couch. You have to recognize you might deal with stress differently. • Triggers from Previous Relationships. Entering into new relationships can certainly be very exciting, but it can also be scary as some of the thoughts, feelings, and emotions from previous relationships can resurface. If your partner is exhibiting a similar behavior to a previous partner, it can certainly strike a strong emotional reaction. While the list above described a few relationship challenges commonly discussed in couple’s therapy, below is a simple guide on how to face these challenges head on! • Communicate. Let your partner what expectations you have. Remind yourself that no one is a mind reader and unless you directly communicate your needs, your partner may have no idea what is bothering you. • Reflect on Your Love Language. What love language are you? What is your partner? Once you identify them, it may bring you closer together and able to communicate your needs to each other more effectively. • Embrace the Differences! Embrace that you each cope differently, even if one of you wants space and the other one wants to resolve things immediately. This is a good time to practice meeting halfway. • Compromise. Meet each other 50/50 as that will create fairness and both of you will feel as though you are having your needs met. • Identify Triggers. Reflect on which triggers you are facing and how that could be surfacing in your relationship. By identifying them, you are better able to cope and communicate them to your partner. While this list provided several common themes and challenges in couple’s therapy, it also provided some possible ways to handle these challenges. Perhaps attempt to reflect on which challenge(s) you are currently facing and which way(s) best help you cope with these challenges. If you too are currently struggling with communication with your significant other, it may be a good idea to connect with one of our skilled counselors at Symmetry Counseling today. You can contact them at 312-578-9990 to set up an appointment. Chapman, G. D. (2010). The 5 love languages: the secret to love that lasts. Chicago: Northfield Pub.